Rebecca-Louise Moody is the drive or 'flower lady' (as is more commonly called!) behind Pollen Designs. "I started my qualifications in Floristry and Amenity Horticulture back in 1996 and have been working in and around the flower business ever since. I love what I do and I m so lucky that my work gives so much happiness to my clients. I take great pride in offering gorgeous flowers and great service"
Here is a link to Flowerona which is a website inspired completely by flowers. 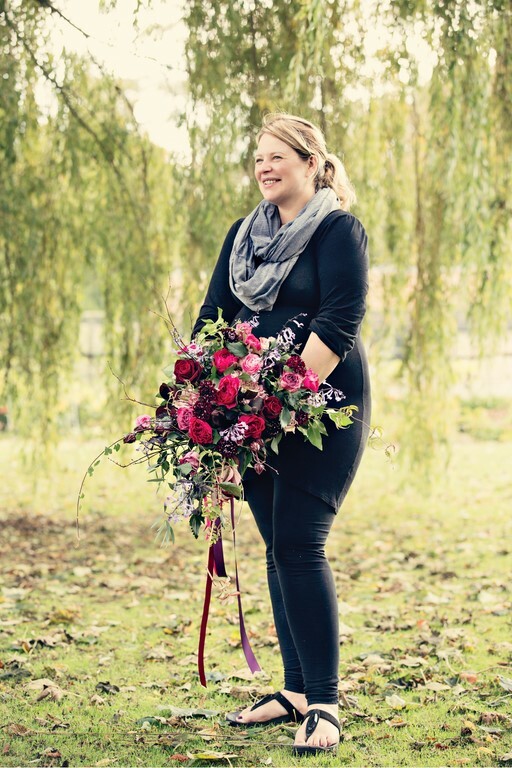 It was a real honour to be asked and I was thrilled when the lovely Rona included us on her Florist Friday section on her blog which you can read just here... it is literally all about Pollen Designs! "Some of my first memories as a child are down on the allotment with my Dad and running riot in my Grandparents garden. Grandma was an avid gardener and couldn't resist a new plant! I now have an allotment of my own, where we grown some of our cut flowers and now introducing our children to the joys of mud and growing things! My Mum has always been into anything creative as well so I guess I was always destined to be happy in a creative role." Love this image of me on set of a shoot.. 9 months pregnant with our daughter Florence.